So, who is this person who’s telling you all about camping? Well, My name is Robin, and I'm the 'mastermind' behind Camping Expert . com. I first started camping as a young child, so young, that I can’t really recall the age when I first started. The first type of camping I did was Car camping, which is what most people do. Having grown up in Ontario, Canada, our family’s annual two week holiday was a camping trip. This took us to different parts of Ontario, from Algonquin and up the Bruce trail. At 16, my mother sent me away on a YMCA Camp Queen Elizabeth backcountry camping trip. I got to choose from the catalogue, and chose a Kayak trip in Killarney. •	Great weather is important - we had 7 days of straight sun and it was glorious! After this trip, I wanted to camp more. I was hoping to teach my family how to interior camp, with the little knowledge that I’d learned, but the following summer I ended up getting a job in a park! Yes, I got paid to camp! I got a job in Quetico Park in Northern Ontario, and there, started to hone my camping skills. I went from a working camper to a trip leader, and have spent thousands of kilometres, and hundreds of days Interior Canoeing. 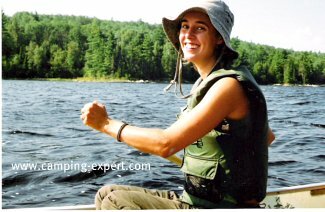 Leading trips, I became very skilled and became pretty proficient in all things camping. Beyond camping, I love learning new things and wanted to learn how to make a website. And what better way, than to make one myself? I found a program that teaches me how to do everything for making a site. It’s called Site Build It, and I’ve learned SO much! Plus I get to share my knowledge with the world! If you think you’re interested in starting a website, then, I’d highly recommend SBI. It is for anyone (that wants to learn of course), even if you have no internet building experience, or even much computer skills. EVERYTHING is taught to you! I hope you enjoy my site Camping Expert .com.